Dr. Force graduated from UC Davis School of Veterinary Medicine in 1986. She worked in a mixed practice in Invercargill, New Zealand for her very first job out of vet school. That was a challenge! Cats & dogs, horses & cattle and the occasional sheep or deer farm. Back in the states she worked in a small animal practice in South Lake Tahoe, California and then Fort Bragg, California before settling down in Watsonville (Santa Cruz county) about 10 years ago. In the 1980’s there was no dentistry department at UC Davis. The second year out of school, though, Dr. Force took the AAHA weekend courses in dentistry and was hooked. It wasn’t until she was working at Santa Cruz Veterinary Hospital, though, that she found they had lots of wonderful dental equipment that was hardly being used that she was able to devote herself to learning as much dentistry as possible. Her first mentor, Dr. Barry Staley, was a retired human periodontist and came to oversee dental cases that Dr. Force was doing at SCVH. Dr. Michael Floyd was a great mentor until he retired a few years ago and then Dr. Brook Niemiec (in San Diego), Pat Frost Fitch and Dr. Alex Reiter were her main mentors. During the last three years she has traveled to several veterinary dental practices around the country to work with board certified veterinary dentists and advance her knowledge and skills. In 2006 Dr. Force was honored to have been awarded a Don Low Fellowship in anesthesia. She spent 20 days at UC Davis in the veterinary teaching hospital working in the anesthesia department with Faculty, residents and students and improving her understanding of anesthesia in critical as well as geriatric and special-needs patients. In 2011 Dr. Force became a Fellow of the Academy of Veterinary Dentistry. She passed a rigorous examination in 2014 and is now a Diplomate of the American Veterinary Dental College. Dr. Force continues to study and learn new skills. She shares that knowledge by lecturing at the national Veterinary Dental Forum as well as to local veterinary hospitals and associations. She has written articles for journals and is currently working on a chapter for veterinary dental restorations book. 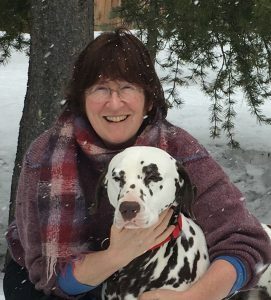 In her spare time, Dr. Force enjoys training and competing with her Dalmatians in agility, obedience and an occasional Dalmatian road trial. She enjoys riding her horses on the trail and in dressage competitions. She also likes to play banjo and guitar and spend time with family and friends. Read more about Dr. Force in the Register Parjaronian. Jeanie comes to us with over 30 years of experience in veterinary medicine. She started in a small general practice in Carmel where she developed a solid foundation. She has a strong background in emergency and critical care and was Nursing Supervisor at both the Monterey Emergency Clinic and Santa Cruz Veterinary Hospital. Most recently she was the primary CCU RVT at a large multi specialty practice in Campbell. Jeanie has loved all aspects of veterinary medicine including management and comes to us as Practice Manager after taking a break to start a family. She is a graduate of Hartnell Colleges Animal Health Technology Program is a Licensed Veterinary Technician and holds a BA in Biology from UC Santa Cruz. She enjoys reading, working out and poodles! She shares her home with her husband, one silly cat and her adorable son. Melinda has been with Dentistry for Animals since 2006 and is the resident computer whiz, bookkeeper, and all around problem solver. She enjoys her time two days a month as our receptionist in Dublin and has fun meeting the cats and dogs as well as their owners. She loves riding horses, fixing up her garden and playing with her new foal. She lives in Livermore with her husband, David and son, Jon, a cat and 3 horses. Shortly after graduating high school she started working as a kennel technician and while working the full time, she had the opportunity to train in all areas of the hospital. Karen became the lead technician and manager at the hospital. In 2009, Karen attained her RVT as a Registered Veterinary Technician. She has special interest in Dentistry, Pain Management, and Anesthesia. In 2013 she began working at Dentistry for Animals to further her education and skills in dentistry. And in 2014, she started studying and training to attaining her VTS a specialty in dentistry. Cindy joins the practice with ten years of client service and veterinary assisting experience. She worked for four years in the surgery department at Santa Cruz Veterinary Hospital. She loves animals and has a calming demeanor that sets the animals at ease. In her spare time she enjoys reading books, watching movies and spending time with her husband, two daughters and their dogs Dexter (Dogue de Bordeaux) and Thor (Jack Russell Terrier). Reagan has been working with animals all her life through FFA and 4H programs, as well as horsemanship competitions. She was born in Santa Cruz, and grew up in the Nevada desert, but recently moved back to focus on her Vet Tech accreditation and passion for deep sea fishing. She also has a kitten named Bennett and a husky/lab named Maple! I am 19 years old and am currently doing my general education at Cabrillo then plan to transfer to Cal Poly to pursue my dream of working in the veterinary field of science. I have been working for Doctor Force for over a year now and am loving the opportunity! I myself have 3 dogs and 2 cats and have been an animal lover since I was born. There was and is no doubt in my mind about pursuing my career in Veterinary Science. I look forward to helping everyone’s companions here at the dentistry and assure the same care toward your animals as I would want for mine. Amanda joined Dentistry for Animals back in 2014. She is currently enrolled at Central Coast College to get her license to become a Registered Veterinary Technician. Amanda grew up with animals and currently has four dogs. In her spare time she enjoys spending time with friends and family, and walking her dogs. Emily joined Dentistry for Animals in mid 2017 after having worked in the veterinary field since she was 18 years old. Prior to working in the veterinary field she was Vice President and President of the Watsonville FFA Chapter where she raised and showed swine. In her spare time she attends Cabrillo Community College and enjoys spending time with her furry family.